Brexit: Leap Into Dark or More Delay? FILE - A pro-Brexit protester argues wth anti-Brexit campaigner Steve Bray outside the Houses of Parliament in London, Jan. 28, 2019. For Britain, leaving the EU with a transition deal will be wrenching enough, a seismic realignment that will tear apart business, economic, security, legal, cultural and political ties that have deepened over half-a-century, enmeshing Britain in Europe and Europe in Britain. But crashing out without a withdrawal agreement will be even more painful — a real leap into the dark. With less than three weeks to go before the country’s March 29 Brexit deadline it still remains unclear whether the country will leave the bloc with a withdrawal deal or crash out without one, exiting even more chaotically and harmfully. Or the British parliament could just delay the whole thing. Monday night Theresa May flew to Strasbourg for last-minute talks with EU negotiators. For the three million continental Europeans living in Britain and a million-and-half Britons living in other EU member states these days are nail-biting. They fear for their jobs, health care and even their homes with their residency rights up in the air. EU citizens in Britain are being required to re-apply for residency — no matter if they've been settled in Britain for decades. The government says they'll be able to remain, but nothing is legally guaranteed. Belgian-born Corine Byron-Danuser says before the Brexit referendum she was “probably one of the proudest non-British Brits you could possibly imagine.” The 46-year-old mother-of-one has been here for 15 years, and during her marriage to a British serviceman she sang gustily “God Save the Queen” with the other military wives. But her “sense of belonging” has been shaken because of a rise in nativism, she told VOA. “It is really hard because the place you called home no longer is. You don’t actually know any more where home is,” she explained. She describes a recent date with a guy she thought “lovely” at first, until Brexit was broached. “Their followed a tirade against foreigners,” she says. There was no second date. Brexit has prompted a Brexodus with tens of thousands of EU nationals leaving. Net migration from the EU to the UK slumped in 2018 to a six-year low, according to government data, with only a 57,000 net increase. For many Brexiters that’s cause for celebration, but not for farmers, or construction and hospitality businesses, nor for the bosses of Britain’s under-staffed National Health Service. 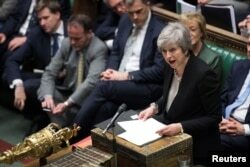 FILE - Prime Minister Theresa May talks about Brexit 'plan B' in Parliament, in London, Britain, Jan. 29, 2019. On Tuesday, Britain’s deadlocked House of Commons is due to vote for a second time on a transition deal Prime Minister Theresa May agreed to with the EU after more than two years of ill-tempered wrangling. But as of Monday, there was fifty-fifty chance she would postpone the vote. In January parliament rejected the deal in the biggest rebuff ever suffered by a British prime minister. Whenever she calls for a vote, she seems on course for another trouncing, say lawmakers, with hardline Brexiters and pro-EU Remainers opposed. The uncertainty is infuriating business owners, depressing economic growth and fueling anxiety. Firms have put investment on hold, adopting a wait-and-see approach. That’s lowered productivity rates. Businesses have been warning for months about both the repercussions of a no-deal Brexit as well the damage being wrought by just not knowing how or when or if the country will break away. Companies have been stockpiling everything they can — from airplanes to car parts — but have been running out of storage space. “We are facing a ‘perfect storm’ in the warehousing and logistics industry,” the UK Warehousing Association has warned in a statement. Fear of a no-deal Brexit has prompted supermarket chains to stockpile imported food; and the NHS and armed forces have been hoarding drugs. So, too, are consumers, fearing the price shock they'll face as a result of the reimposition of tariffs for goods, which will drive up shop prices and lead to delays and shortages in fresh meat, fish, fruit and vegetables, say Britain’s retailers. Remainers have been painting ever more lurid depictions of economic breakdown and social stress. Brexiters dismiss the dire forecasts as fanciful, dubbing them “Project Fear,” part of a naysaying vision offered by traitorous globalists. They say even if the country crashes out, it will thrive, and they point to how well foreign investment into Britain has stood up. Foreign investment, indeed, has been inching up, and in the first full year after the Brexit plebiscite it did hit a record high. But the headline figure is deceptive, warn economists. The increase is far lower than in the three years before the referendum and is increasing at its weakest rate in almost a decade. More ominously, foreign investment has plunged by 19 percent for ‘greenfield’ projects, where an investor builds a business from scratch. The British and EU governments have started to implement contingency plans for a no-deal Brexit. A taste of what that would mean for travelers and shippers came last week when France and Belgium tested new Brexit-style border arrangements, triggering two-hour long lines for disembarking rail passengers and lengthy gridlock for transport haulers. “This will be what it is like after Brexit,” mused a French port director.